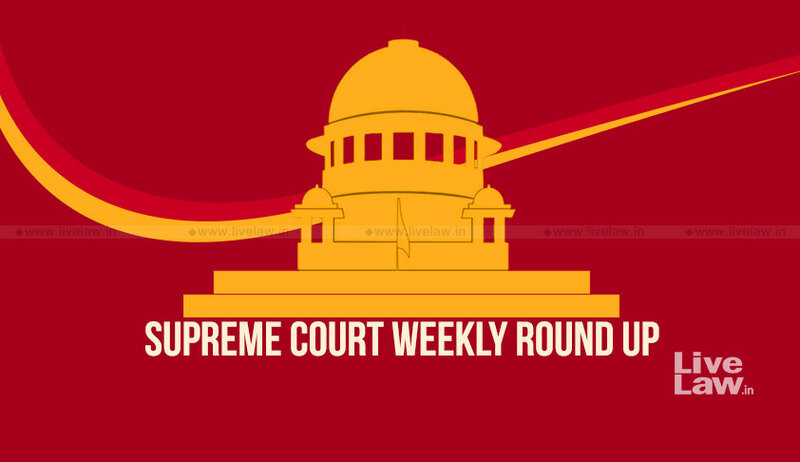 “The writ of mandamus cannot be issued to the legislature to bring about an amendment in a legislation,” remarked the Supreme Court bench of Chief Justice Dipak Misra, Justice DY Chandrachud and Justice AM Khanwilkar on Friday. Overruling a Kerala High Court full bench judgment, the Supreme Court in KA Annamma v The Secretary, Cochin Co-operative Hospital Society Ltd, held that the Kerala Co-operative Societies Act and the Industrial Disputes Act both possess and enjoy the concurrent jurisdiction to decide any service dispute arising between the Co-operative Society’s employee and his/her employer. Elucidating the principles of “under-insurance” and “averaging out”, the Supreme Court, in IC Sharma vs The Oriental Insurance Co Ltd, held that when a group of items is insured under one heading and only some of the items and not all items are lost/stolen, then the principle of under-insurance will apply. The court also held that if all or most of the items of value covered under the policy are stolen, then the insurance company is bound to pay the value of the goods insured. The Supreme Court recently stayed proceedings in a matter at the National Company Law Tribunal’s Mumbai bench observing that there seems to be a prima facie case of a collusive effort between the promoters and the petitioners. The division bench of Justice Rohinton F Nariman and Justice Navin Sinha made the observation while hearing a civil appeal filed by investors of a collective investment scheme run by two companies namely Royal Twinkle Star Club Ltd and Citrus Check Inns Ltd.
A Supreme Court bench headed by Chief Justice of India (CJI) Dipak Misra directed the Centre to set up a committee exclusively to deal with any unpredictable disaster that would occur at the downstream of Mullaperiyar dam in Kerala. The bench also directed the state of Tamil Nadu, owner of the dam, and Kerala, where the dam is located, to set up their own committees under respective state plans to work in co-ordination with central committee in case of any disaster. The Supreme Court bench of Justice SA Bobde and Justice L Nageswara Rao on Thursday criticized the order dated September 13, 2017, of the Punjab and Haryana High Court, suspending the sentence of imprisonment for 20 years of two students of Jindal Global Law School convicted for gangrape of a co-student and permitting their release on bail during the pendency of the appeals against the conviction. The Supreme Court on Wednesday stayed the order of the National Company Law Appellate Tribunal which said the provisions of the Limitation Act were not applicable for initiation of Corporate Insolvency Resolution Process under the Insolvency and Bankruptcy Code (IBC). The least we expect is that the language is such that it can be understood, said the Supreme Court, as it took a strong exception to the ‘casual’ approach of the Maharashtra Government in filing delay condonation applications. The bench comprising of Justice J Chelameswar and Justice Sanjay Kishan Kaul Court dismissed a Special Leave Petition filed by the state against acquittal, on the ground of delay. The Supreme Court on Saturday posed pointed questions to a petitioner seeking re- opening of the assassination of Mahatma Gandhi, and asked him to satisfy it on aspects of delay and his locus to raise this issue. In case, a wife obtains an order of maintenance passed in the proceedings filed under Section 125 of CrPC is to be followed, and another order passed in the proceedings filed under the Domestic Violence Act, which of the either is to be followed by the husband or whether he should follow both. The Supreme Court issued notice in special leave petitions filed by a husband against Bombay High Court order which ordered that he should follow both orders. A two Judge bench of Supreme Court of India issued notice to Kerala Chief Minister Pinarayi Vijayan and two other accused who were discharged by the CBI Special Court and Kerala High Court. The Bench also stayed the trial of other accused who were not discharged in the case. The Supreme Court, on Monday, directed the Bar Council of India (BCI) to furnish district-wise data on the number of law colleges that can be permitted to operate in a particular State. The Bench comprising Justice Arun Mishra and Justice Mohan M. Shantanagoudar also demanded a list of law colleges approved by the BCI in various States. The BCI Secretary was directed to file a detailed affidavit before the next date of hearing. The matter has been directed to be listed in the 2nd week of March. In a major order, the Supreme Court on Wednesday said it will hand over as many as 186 anti-Sikh riot cases which was earlier closed, to a new three-member Special Investigation Team (SIT) for fresh investigation. A bench headed by Chief Justice Dipak Misra said the supervisory body, appointed by it has found that out of 241 cases, 186 cases were closed without investigation.